(1)Anuj Joshi class 8-D Participated in State level Khel Maha Kumbh Table Tennis tournament as Captain of Ahmedabad team in rural category under -14 Table Tennis. The tournament was held at Bhuj, Gandhigham from 12 to 13 November 2018 and secured Third position. He is also selected for school game U-14 National camp. (2)Nishit Chauhan of class 8-H Participated in State level Khel Maha Kumbh Table Tennis tournament in under -17 Team event . The tournament was held at Bhuj Gandhigham from 13 to 15 November 2018 and secured second position. (3)Adit Shah of class 11-D Participated in State level Khel Maha Kumbh Table Tennis tournament in under -17 Team event. The tournament was held at Bhuj Gandhigham from 13 to 15 November 2018 and secured second position. He is also selected for school game U-17 National camp. (1)Archi of class IX-E participated in the Khel Maha kumbh State Level Badminton Tournament held at WAGHODIA, VADODARA, Gujarat from 14th -17th November 2018. In the individual singles category U- 17 she got second position : Silver Medal and in the same tournament in the U -17 team event she was 1st Gold Medal. 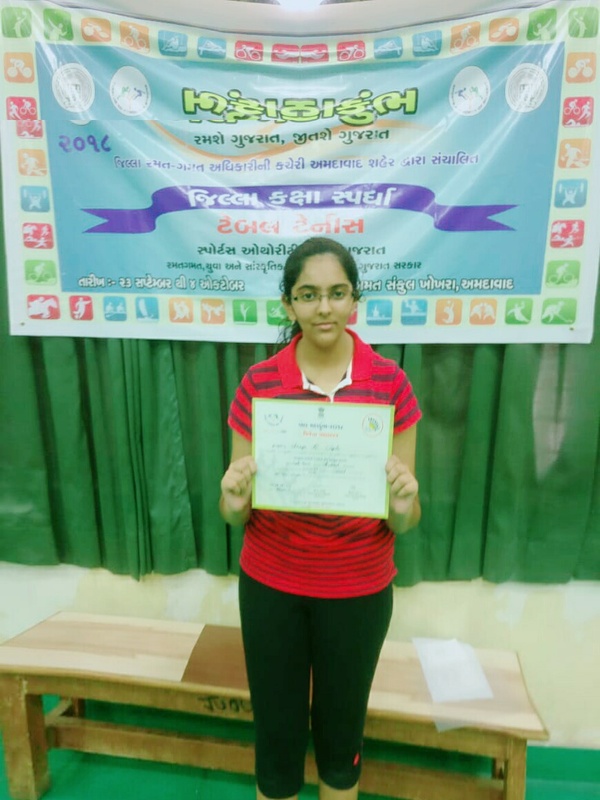 (1) Varenya Saini of class 10-A Participated In CBSE Cluster XIII Table Tennis tournament held at Bhagwati International Public School, Patan,Gujarat. She became Champion in U-17 Girl’s Singles category. (2) Anuj Joshi Student of class 8-D Participated In CBSE Cluster XIII Table Tennis tournament held at Bhagwati International Public School, Patan, Gujarat. He has Secured Third Position in U-14 Boys Singles category. (1) Delhi Public School-Bopal,Ahmedabad organized U14 Girls Khelmahakumbh Basketball tournament. 8 teams participated in said tournament and Delhi Public School emerged as 3rd place and 6 girls are qualified for the State level khelmahakumbh. (2) Under-17 Girls category in CBSE Cluster XIII Volleyball Championship held at Shri Ramkrishna Harikrishna Mission Academy, Surat, Gujarat from 5th October to 8th October. Hiya Makwana of class IX - K participated in the volleyball championship and was awarded with 'BEST ATTACKER OF THE TOURNAMENT' award in U - 17 girls category. (3) Above - 17 Girls Volleyball team participated in District level KhelMahakumbh 2018 at Swastik high school khoda, sanand viramgam highway on 10/10/2018. Total 8 teams had participated and Delhi public school-Bopal, Ahmedabad emerged as Champion and 5 Girls were selected for State level Volleyball tournament. (1) Under-19 Girls category in CBSE Cluster XIII Volleyball Championship held at Shri Ramkrishna Harikrishna Mission Academy, Surat, Gujarat from 5th October to 8th October. Across Gujarat 14 teams had participated and DPS BOPAL emerged as Runner Up. (2) District level Volleyball U-14 Girls Khel Mahakumbh tournament held at Delhi public School- Bopal, Ahmedabad, eight teams participated in said tournament and DPS-Bopal emerged as Runner-up. (3) District level Volleyball U-17 Girls Khel Mahakumbh held at Delhi public School-Bopal, Ahmedabad, nine teams participated in said tournament and emerged as Champion. (1) Delhi Public School – Bopal, Ahmedabad organized U-17 Boys Rural KhelMahakumbh District level football tournament in campus on 8/10/2018. Our school participated in the tournament and became 2nd Runner up. (2)Delhi Public School – Bopal, Ahmedabad organized U-17 GIRLS Rural KhelMahakumbh District level football tournament in campus on 09/10/2018. Our school participated in the tournament and became Runner up. (1) Delhi Public School – Bopal, Ahmedabad organised KhelmahaKumbh U-14 basketball boys tournment on 4/10/2018. U-14 Boys team emerged Chanpion by defeating Tulip International School Bopal by 20 points. Abhinav of DPS was the highest Scorer. U - 14 Boys participated in Ahmedabad Rural Volleyball Association District level tournament held at Umiya campus S. G. Highway and emerged as CHAMPIONS and are qualified for State level. U - 19 Boys participated in Ahmedabad Rural Volleyball Association District level tournament held at Umiya campus S. G. Highway and emerged as Runners up. 6 students are qualified for State level. U - 19 girls participated in Ahmedabad Rural Volleyball Association District level tournament held at Umiya campus S. G. Highway on and emerged as CHAMPIONS and are qualified for State level. U - 14 girls participated in KhelMahaKumbh Taluka level Volleyball tournament at Gangeshwar Vidhyalay Kanbha and emerged as Runners up and are qualified for District level. U - 17 girls participated in KhelMahaKumbh Taluka level Volleyball tournament at Gangeshwar Vidhyalay Kanbha and emerged as CHAMPIONS and are qualified for District level. Above 17 girls participated in KhelMahaKumbh Taluka level Volleyball tournament at Gangeshwar Vidhyalay Kanbha and emerged as Runners up and are qualified for Districts. U-14 Judo Tournament held at Khokhar Sports Complex, Khokhra circle, Maninagar, Ahmedabad on 26th & 27th September 2018. Abdul Aziz Sayed of class 6-F, Anushka Shah of class 6-D, Shreyaa Gangwar of class 6-A secure Bronze medal in 40 kg, 27 kg & 32 kg respectively. U-14 KhelMahakumbh District level Handball Tournament for boys organized by District Sports Office- Sports Authority of Gujarat-Ahmedabad Rural at Sanskardham School, Godhavi and achieved Runner-up position. Out of the whole team 4 students of our school are selected for State level tournament. U-17 KhelMahakumbh District level Handball Tournament for boys organized by District Sports Office- Sports Authority of Gujarat-Ahmedabad Rural at Sanskardham School, Godhavi and achieved Second Runner-up position. Out of the whole team 3 students of our school are selected for State level tournament. Anushka Bhardwaj of class 9-C Participated in KhelMahaKumbh Table Tennis tournament held at Khokhra Sports Complex, Khokhra and secured 3rd Position in U-17 Girl’s category. She is selected for state. Adit Shah Student of class 11-D Participated in KhelMahaKumbh Table Tennis tournament held at Khokhra Sports Complex, Khokhra and become Runner-up in U-17 Boy’s category. He selected for state. Nishit Chauhan Student of class 8-H Participated in KhelMahaKumbh Table Tennis tournament held at Khokhra Sports Complex, Khokhra and secured 4th Position in U-17 Boy’s category. He is selected for state. Shreya Gupta Student of class 10-C Participated in KhelMahaKumbh Table Tennis tournament held at Khokhra Sports Complex, Khokhra and secured Second Position in U-17 Girl’s category. She is selected for state. Varenys Saini Student of class 10-A Participated in KhelMahaKumbh Table Tennis tournament held at Khokhra Sports Complex, Khokhra and become champion in U-17 Girl’s category. She is selected for state.